The Porsche 918 Spyder hybrid, seen here at the Geneva auto show, will run for 25 kilometers (15 miles) on electric power. BERLIN -- Porsche has started taking orders for its 918 Spyder hybrid sports car, its most expensive model ever, which will will sell in Europe for 768,062 euros. The company will limit production to just 918 vehicles. The first cars, available for ordering starting today, will be delivered to buyers beginning in November 2013, the company said in a statement. The two-seater will accelerate to 100 kilometers (62 miles) an hour in 3.2 seconds and soars to a top speed of 320 kilometers per hour, relying on a 500-horsepower V8 engine and electric drive-systems that allow the vehicle to run more than 25 kilometers on electric power. Porsche is developing the plug-in hybrid vehicle at a research facility near Stuttgart. The car will be built at the main Zuffenhausen plant. Porsche plans to add models with a goal of doubling the company's annual sales to as many as 150,000 vehicles over the medium term, and benefit from savings from the planned combination with Volkswagen AG. 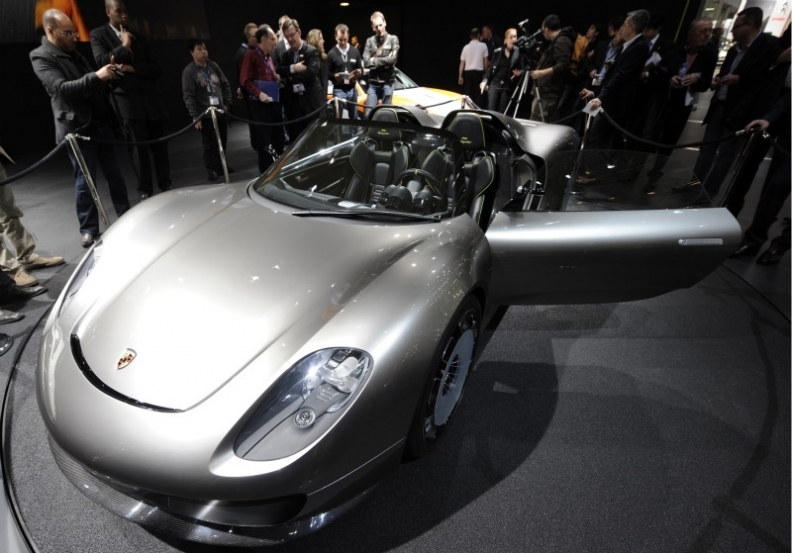 The Spyder hybrid is based on the Carrera GT supercar as well as the 917 and RS Spyder. The car will have a safety frame reinforced with carbon fiber and a manual roof system with removable panels that can be stowed in the front luggage compartment, Porsche said today.